Superman and Supergirl have a couple of things in common. They are the last son and daughter of Krypton. And they both acquired super powers living under a yellow sun. But their origin stories differ in dramatic ways. Kal-El came to Earth as an infant. As a result, his personality and identity were nurtured by life experience and environment. Growing up in Smallville was his only reality. Kara Zor-El, on the other hand, was a teenager when her parents launched her toward Earth. Not only did she have specific memories of Krypton, but she witnessed her home planet explode in the rearview mirror of her space pod. Author Lisa Yee uses this backstory to imbue Supergirl with a substantial amount of super angst. Kara was the strongest teenager in the world (she could hold a brachiosaur aloft with just her pinky finger, for example), but she was a mopey kid who grappled with pangs of self-doubt. You couldn’t blame her of course. She missed her parents, she missed her friends, and she struggled to acclimate to her new home world. Her cousin Kal-El was the most famous superhero on Earth, but she was just a lonely little space alien. Enrolling at Super Hero High was probably the best thing Supergirl could have done. Instead of being isolated on the Kent’s farm in Kansas, she now mingled freely with a bunch of classmates who had empathy for her situation. Like all secondary schools, Super Hero High had a clique of mean girls roaming the hallways (Cheetah, Killer Frost, and Star Sapphire to name three), but it was mostly home to a friendly group of kids like Wonder Woman, Bumblebee, Hawkgirl, and Beast Boy. Barbara Gordon in particular (not yet in full Batgirl bloom) quickly became Supergirl’s best friend and most enthusiastic champion. But Supergirl had a lot to learn. For one thing, she was now in possession of superpowers so intense, she was afraid to sneeze for fear she would destroy something or someone. She didn’t even know how many powers she had. They were growing at a rate faster than a speeding bullet. Thankfully, things get sorted out before Granny Goodness and her furious female furies arrive on campus. 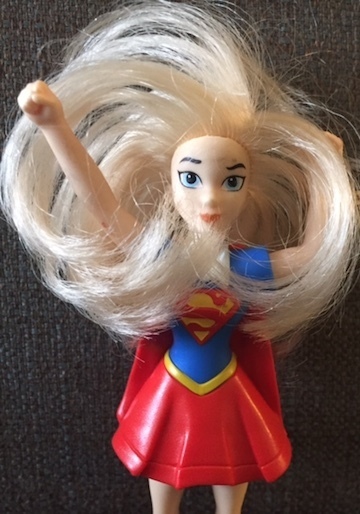 With a little pep talk from Wonder Woman (“The stronger you are,” she says, “the stronger we are”), and some tutelage from Principal Amanda Waller, Supergirl stops feeling sorry for herself and reaches her superhero potential. Yee’s previous Wonder Woman novel (see our review here) was perkier than this one. But that makes sense. Immortal Amazon princesses don’t have much teen angst. In this case, the author had to respect Supergirl’s personal journey. A young girl doesn’t lose her parents and travel 21.7 light years through space to another planet without being a little traumatized. This entry was posted in Marvel/DC, Published in 2016 and tagged DC Comics, Lisa Yee, Supergirl, Supergirl at Super Hero High. Bookmark the permalink.